Designed by professionals - for professionals, WaterMark skimmers were created to provide an efficient, effective method of maintaining a beautiful water garden. An easy flow-through design combined with simple installation and minimal maintenance offers ideal solution for any existing or new water garden or Koi pond. The purpose of these skimmers is to provide complete pond surface cleaning - removing grass, leaves and more. Add one of our biological waterfall filters for a complete system, or connect to a bottom drain kit for additional filtration. Watermark skimmers truly are a water gardening innovation. The new wildlife gate inhibits fish, frogs and other aquatic life from swimming into the skimmer. The weir gate latches shut to allow for easy maintenance, allowing access to the skimmer or pump without draining the pond. New Bio Brush technology offers flow-through advantage - adding filtration to increase biological surface area and agitation action to break up small debris. A multi-port design for discharge kits allows the installer to choose which side of the skimmer to discharge water, increasing the flexibility of the pond design and installation. 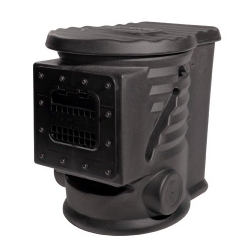 An optional bottom drain port, located on either side, is ideal for Koi and other fish ponds. This helps keep the bottom of the pond sludge-free. Finally, a durable lid was created strong enough to place a flagstone of small boulders on top of the skimmer, helping to conceal its location. A special fill port in the lid allows you to add sand for extra weight and stability.